If you like this Product you might be interested in the Pro Series Promo at just $199 (MSRP $249) for all three of the Plug-ins ! 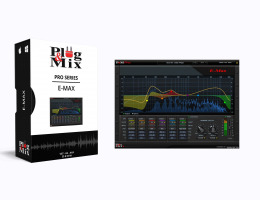 Emax is a professional Equalizer that is one of the most essential tools for any producer, mixing or mastering engineer. P&M E-Max Equalizer provides the highest quality tool for sculpting your sound with a stunning new interface for precise control. Click and drag any colored point on the line to move it. Move a colored point up or down to boost or cut the gain of the selected frequency. - Double-Click a colored point to reset the gain to zero. Listen : Solos the selected band for precise control. Filter : Selects variable filter modes: Bell, Low/High Cut, Low/High Shelf, and Notch. dB/Oct : Low and High Cut filters feature 6, 12, 24, and 48 dB/Octave modes for subtle to extreme filtering. Freq : Determines the frequency of the selected band. Gain : Determines the gain of the selected frequency band. Q : Adjusts the bandwidth or resonance of the selected band. XBass : Boosts the overall low end of your material. XPanse : Boosts the overall high end of you material. Linear Phase : This EQ mode preserves original music balance with zero phase shift. Clipper: For limiting your signal’s overall output. Output Level : Controls the output level of the plug-in. AudioUnit, AAX (Pro Tools) and VST plug-ins. Windows 7 and up - XP - Vista (32-bit and 64-bit). VST, AU and AAX (Pro Tools) plug-ins. The Plug & Mix Plug-ins DEMO download links are available from our "Download Page". Download the full Pro Series collection. Once downloaded, launch the installer and select the plug-in(s) you wish to install. Once installed, the plug-in(s) will start working in DEMO mode. You only need to authorize them as described in the authorization paragraph bellow to use them with no limitation. Download P&M Pro Series Plug-ins. If you still need to contact us, go to the CONTACT page. All product names used above are trademarks of their respective owners which are in no way associated or affiliated with Plug & Mix. These trademarks of other manufacturers are used solely to identify the products of those manufacturers whose tones and sounds were studied during Plug & Mix’s sound model development.